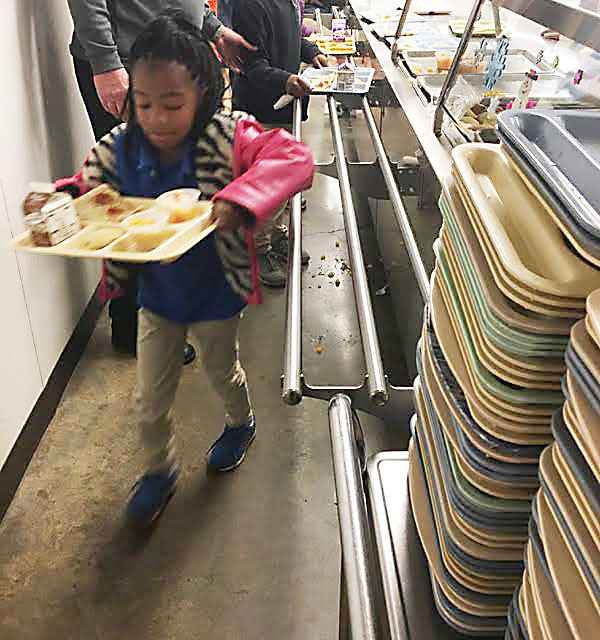 One of Blytheville Primary School’s second-graders takes a tray of food from a Food Service employee during the “Offer vs. Serve” choice, which began Nov. 28 after school resumed following the Thanksgiving break. The second-graders seemed very happy about being able to have choices with their lunch, much like the rest of the students at the district’s other schools. Food Service employees at the Blytheville School District are attempting something for part of the student body at Blytheville Primary School that the other district students have been doing for quite a while, and Tiffany Snyder stated that she could not imagine that plan going over as well as it has. Snyder, director of Food Services, told the second-graders in November that when they returned after the Thanksgiving break on Nov. 28, they would have the “Offer vs. Serve” choice in the lunchroom, just as the third through 12th grade students have in their respective schools. Privately, Snyder was concerned that the second-graders might not be able to handle that choice, which might create more confusion. In “Offer vs. Serve”, the students receive five to six items for lunch, beginning with a meat and a bread (normally, a roll). They are then allowed a choice of two items and milk, but each student must take either a fruit or vegetable. In some cases they may take both. During lunch one day the second-graders were offered broccoli, something Snyder said the Food Service employees did not make much of because it hadn’t been very popular with the students. Instead, the second-graders took so much of the broccoli that the employees had to prepare even more. The success of “Offer vs. Serve” with the second-graders now has Snyder considering it for the first-graders when the second semester begins in January.